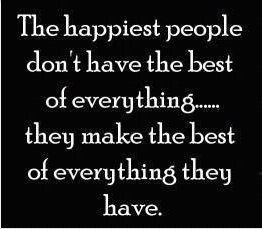 Happy Tuesday Everyone!! Before I begin, I want to again thank each and every one of you who email me or leave such wonderful comments on my blog. I read every single one and even though it may take me a while to respond, know that each one means so much to me! Now onto the laundry. I love doing things around the house...cooking, cleaning, organizing, moving furniture (that's for you Jenny in Australia), but laundry...not so much. Don't get me wrong, I love "doing" the laundry. I have organizing bins to separate the colors, I have little baskets to carry it down stairs to the washer, I like picking out the soaps and dryer sheets that smell the best... it's putting all the laundry "away" that I hate. When doing laundry I use these racks all the time. I dry all our clothes in a dryer except for my husband's. He is 6' 3" and the length of his pant and the fit of his shirts are just perfect as long as I don't dry them in a dryer...hence these racks. However, I stole this one a long time ago for my quilting. I also bought this mini one for a table top version and it also mounts on the wall. What do I use it for? Well, I use the mini one to keep fabrics neat and wrinkle free as I'm cutting strips or blocks. In the past, I would just throw the fabric in a pile off to the side and when it was time to go back and cut more, the nice neatly ironed fabric was a mess. This way I'm not searching for it either. You can use the stand up larger one for fabrics too, but I've been using it when I'm strip piecing. 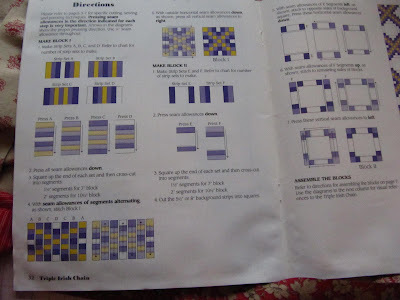 This pattern below is Triple Irish Chain. 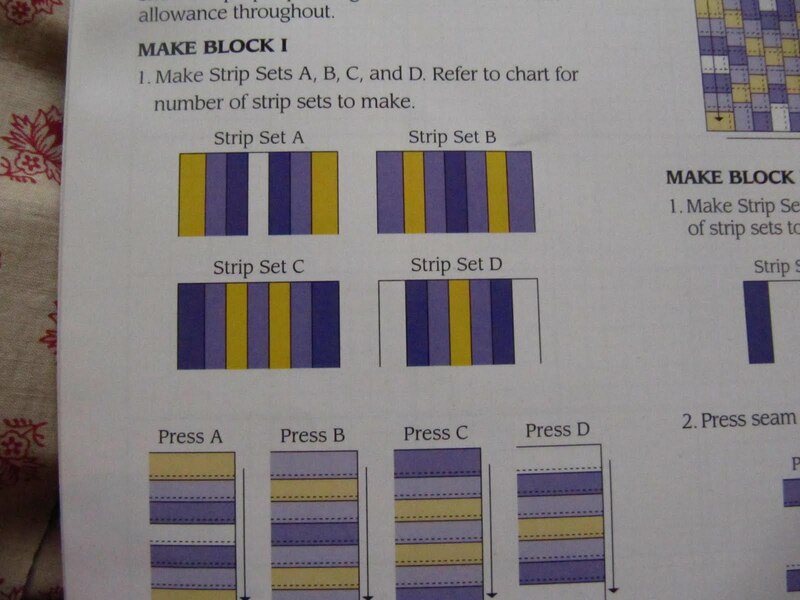 It has 6 different strip sets. 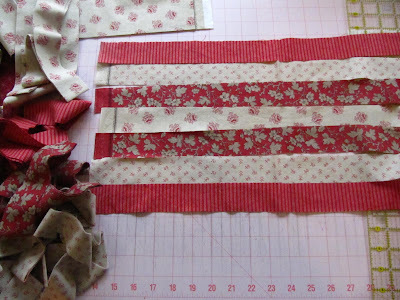 Strips that are 1 -1/2" wide and 44" long. Here's a close up of 4 of the 6 I have to sew together. 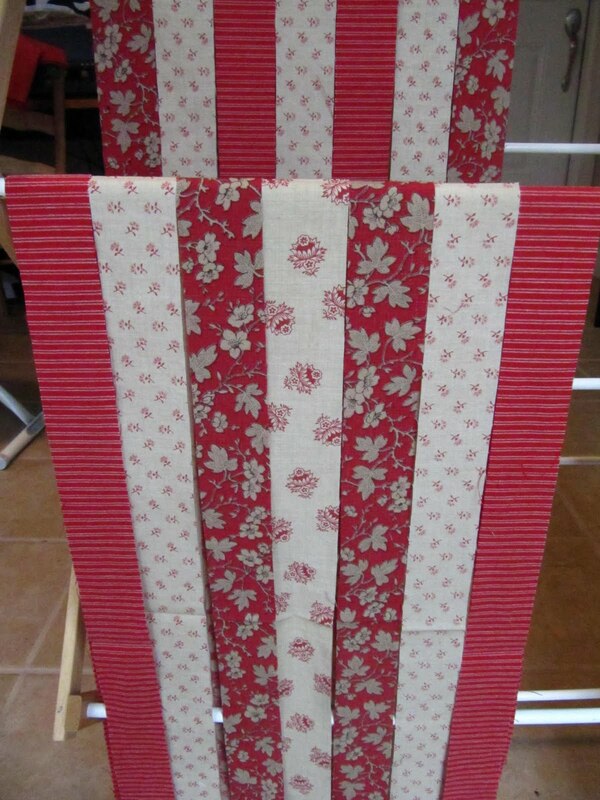 This is the first strip set "A" that I cut from Moda's Rouenneries. It's all laid out on my cutting table. If I left it there and started to put together the next set (set "B")...I'm seeing a seam ripper in my future. So here's what I have been doing for years. Hanging the strip sets on the drying rack in the order I have to sew them. I keep this by my sewing table when I'm sewing this type of project. 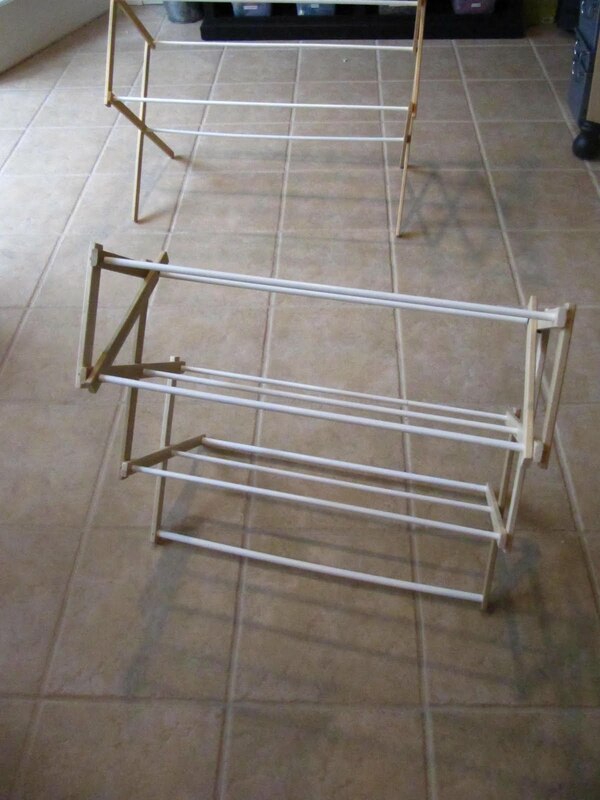 These racks fold up very easily and can be stored under a bed, in the closet or behind a door when not in use. The small one that I mentioned before, can be mounted on the wall and it's collapsible too. This rack is a seam rippers worse nightmare. It will keep you organized and all the strips will be sewn in the correct order. Give it a try. 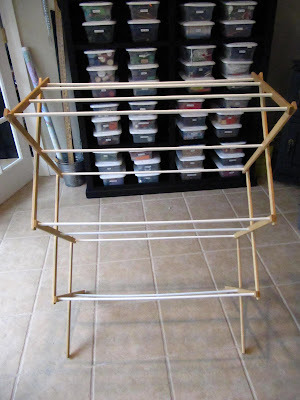 It works so well...this rack will be in your sewing room forever. You'll never have to do laundry again. Oh wait, that's not possible. Wishful thinking though. 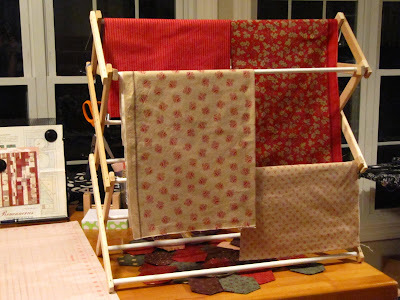 Me too = I've used mine always for laundry, now it'll be used for my quilting too. Great idea. Clever ... I don't have one ... will have to get one! 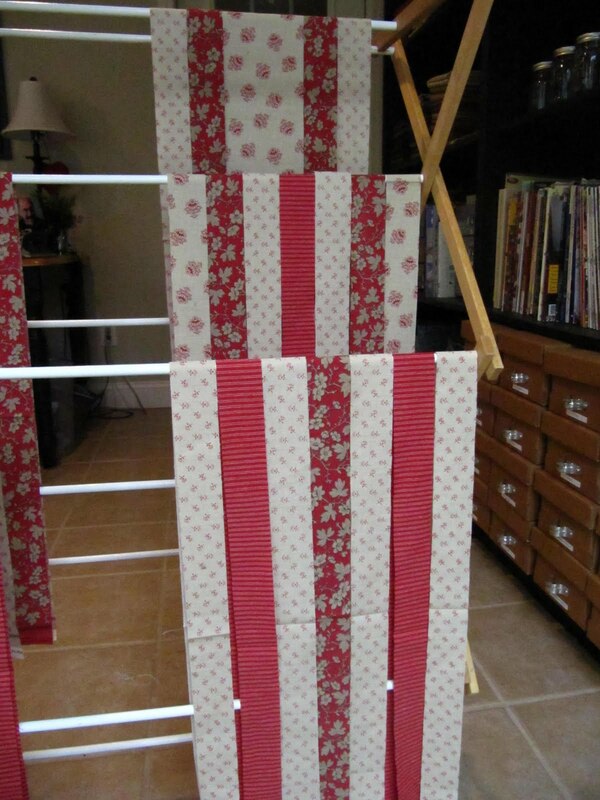 I have actually used my folding laundry rack for sorting strips when quilting.......but there is such a tight amount of room in my sewing area that I can't do that easily........but I can tell you it is a big help to use a rack like that! Unlike you, I like to do laundry. Every time I do it I think of how hard a job it was for our grandmothers and mothers, and how easy it is for me. 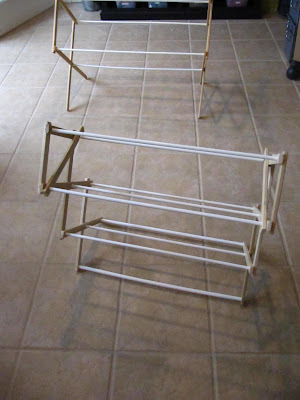 But, like you, I like drying racks, and have used them for the use you show today. I hope you'll show us the finished pieced quilt that you are working on. I love that fabric. Just last week I purchased a new (better) drying rack. (How coincidental is that?) Instead of throwing out the old one, I'll move it to my new sewing area. Great idea! Ok , Karen, this time I am proud to say I thought of this, too. Great Minds think alike or is it fools seldom differ....I prefer great minds. 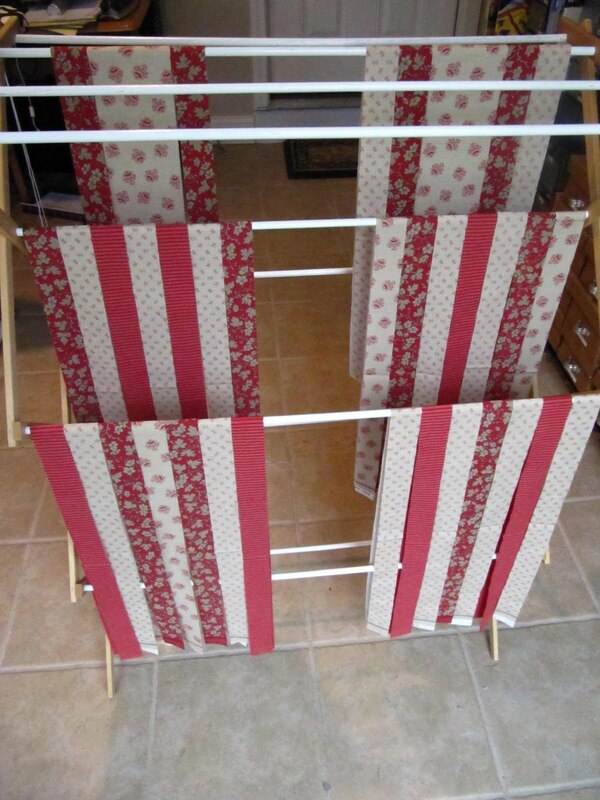 I use my drying rack most of the time in the laundry room. So I will keep an eye out at garage sales for another one. You also made me think of those towel racks that were metal or wood and folded to the side that were usually under the old sinks. 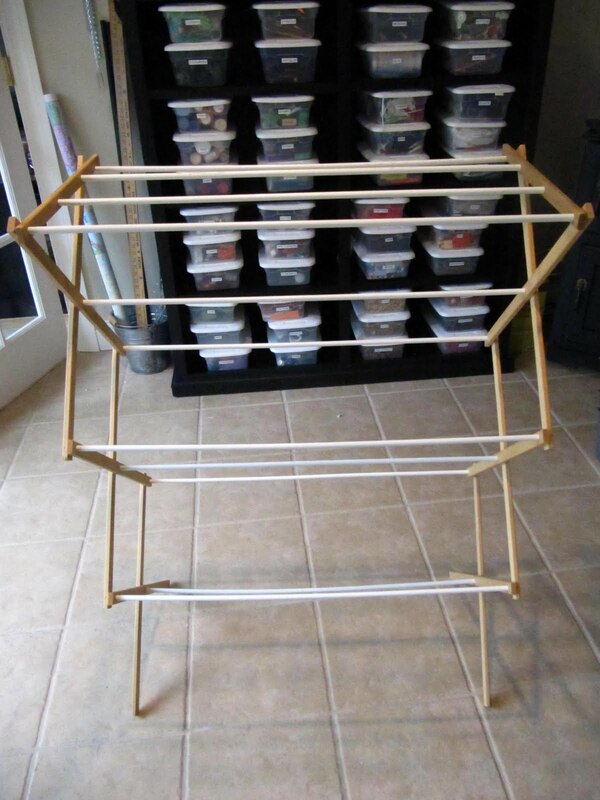 I just found one that would work great on my kitchen queen near my iron to hang strips. Thanks, again for another wonderful post. What a great idea! I have to keep my airer on a table now - we have a husky with a very fluffy tail that swishes dirt all over the washing! Hey! 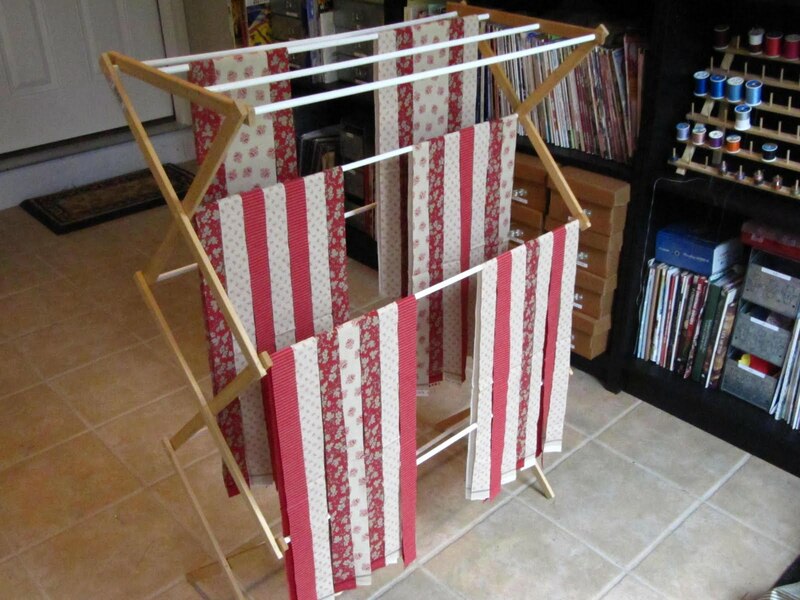 Good tip for that dryer rack! 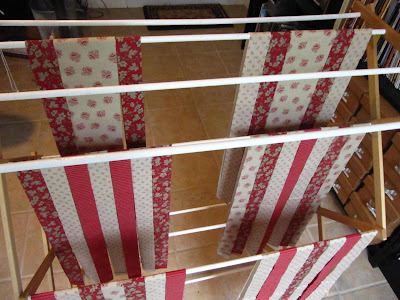 I have the floor one I bought for hanging fabric that I prewash that may need several washings, like red. 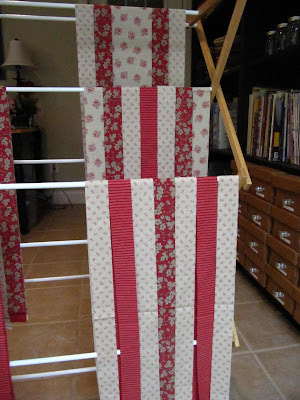 I lay the washed fabric on a white towel (it is a "raggy" towel), hang it over the rack, and wait to see if it bleeds. But using it to keep my freshly ironed fabric wrinkle free is a great idea! Thanks! That is a good idea, I am always forgetting where I am, when quilting and lay them on the floor. What a great idea! It is always a challenge to keep things straight when you are sewing so many pieces together. I just found your blog and have already bookmarked it! I have two of these, which I actually use for my laundry, when I can't hang it outside to dry, but will be watching for a smaller one to put near my sewing area now. What really caught my eye is the book you are using to make your triple irish chain...I just purchased a second copy of this book, since my first seems to have gone astray (can you say, buried?!!). Look forward to seeing what other goodies you can locate for us in the coming weeks. What a super idea. I am bringing mine up from the laundry room right now. That is a neat idea. Thanks for sharing. Wonderful idea Karen! And don't those rounneries just look de-lish?!!! Lots of love! Happy Easter! Great idea, Karen! I love my laundry rack...I use it to hang herbs to dry or spinning fleece and yarn when I dye it. Also, there are five of us and not enough "towel space" in the bathroom so I have a wooden laundry rack in there that we hang the bath towels on. What a great idea to keep organized. Thanks for sharing. Great Idea Karen, thanks for sharing with us. I hope you'll share your quilt with us, love those Rouenneries fabrics. 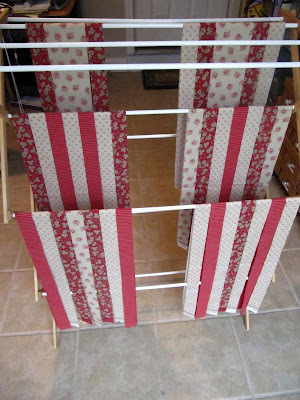 I use this idea too but wanted to mention how beautiful that Rouenneries looks all hung on the rack! !